My husband has been out-of-town on business travel for almost a couple of weeks now. Last Friday night I was so tired, but yet it was too early to go to bed, so I decided to see what movie I could watch that would be interesting enough, light enough and still entertaining. There is a long list of movies I still need to see; Nebraska, The Wolves of Wall Street, American Hustle, Catching Fire, that’s just to name a few. But these are all so heavy. Plus, my husband wants to see them too, so I’ll have to wait until he comes home so we can watch them together. I settled on the new Footloose. It’s been in my Amazon Prime watch list for a long time, and I decided to make Friday the day I would cross it off the list. I wonder if I had seen the new movie first, would I have liked it as much as I liked the original? I wonder if I was 12 when I watched the new movie, like I was with the original, would I have liked it as much as the original? I wonder if I had seen the original when I was 42, as I am now, would I have liked as much as I did when I first saw it? I wonder if they had actually put some dancing in the new version would it had made it any better? I wonder if anyone could ever replace Kevin Bacon? I wonder why they chose Dennis Quaid to play the Rev. Shaw? I wonder why Andie McDowell didn’t have a bigger role? I wonder if it took her less than half an hour to memorize the three sentences she said in the entire movie? I wonder why do they want to remake movies that should never be remade? Overall, the new version wasn’t the worst movie I have ever seen. But at the same time, it won’t be going into my list of favorites, either. Likewise, when the original plays on Lifetime or A&E and I will watch that one any day of the week. Even if the total number of times I’ve seen it approaches 200. But I’ll pass on the new one. Once was enough for me. 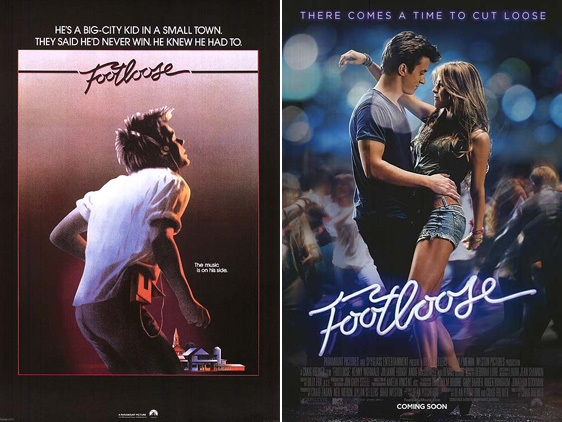 Did you see the new Footloose? What were your thoughts? Categories: Just for fun, Movie Reviews, Random Thoughts | Tags: bubble gum movies, footloose, i miss kevin bacon | Permalink.